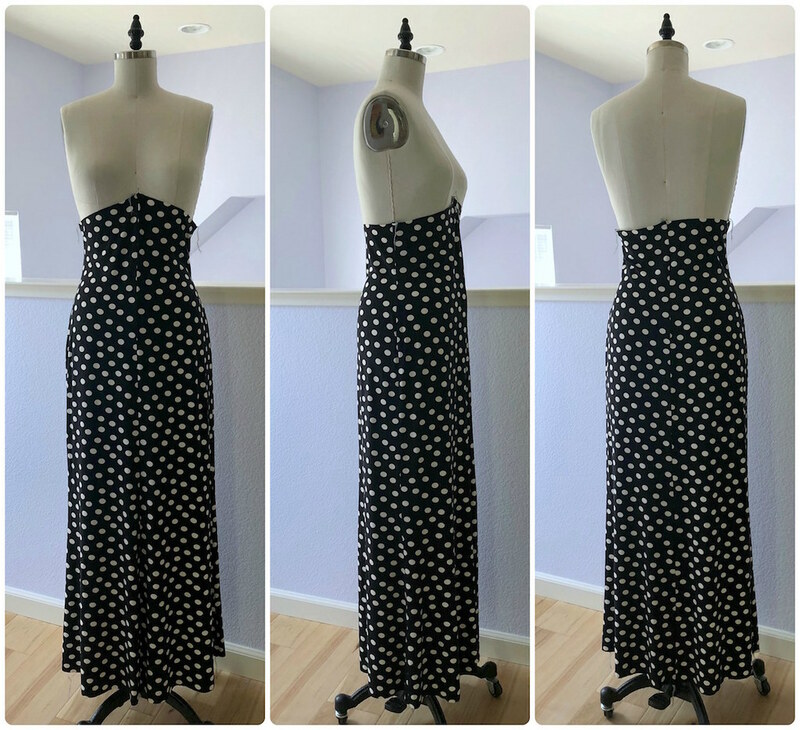 A couple of weeks ago, I decided it was time to make another knit dress. 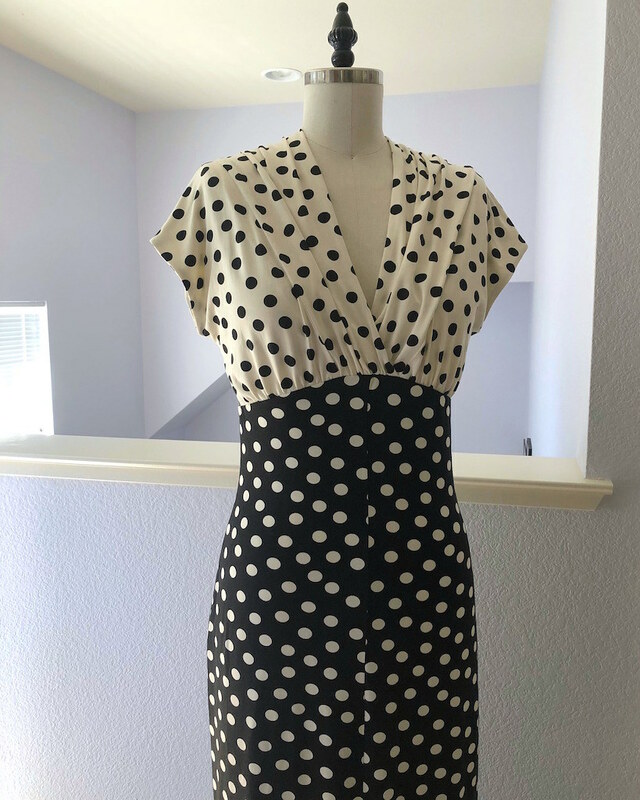 Yes, my first and only other knit dress is also polka dotted. 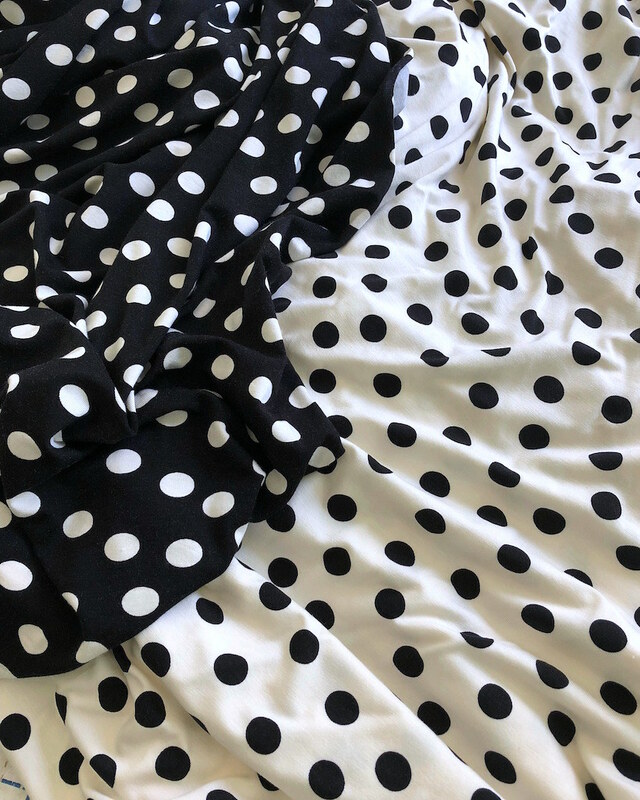 So sue me - I have a polka dot addiction - they are very hard to resist, in my opinion. 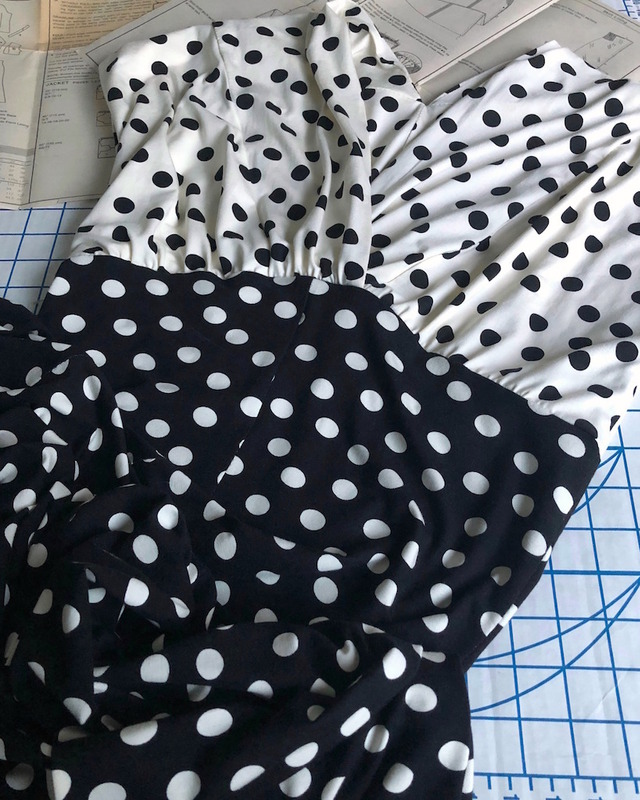 The pattern I chose for my polka dots was Butterick 6410. 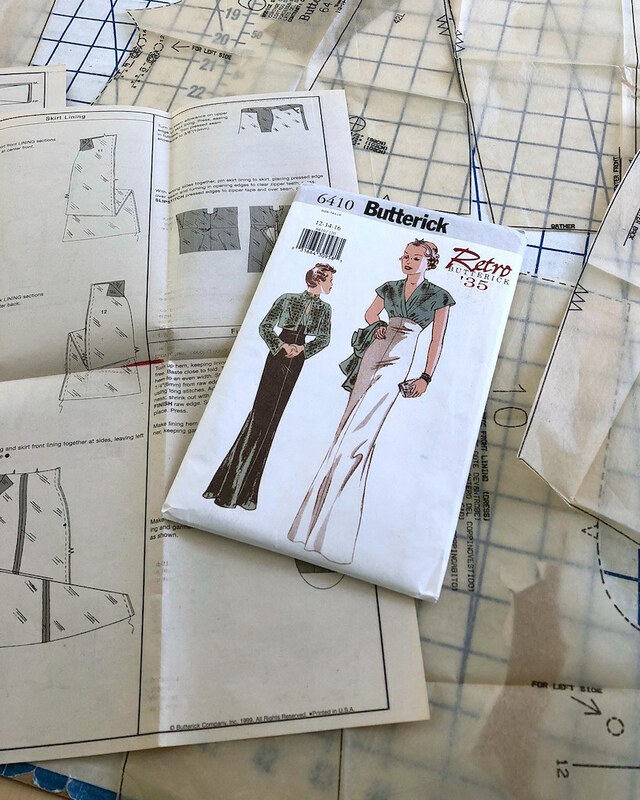 Ever since I pulled my first version of the dress out of the closet last September, I wanted to make another. But this time, I thought I would try using the design with a knit fabric. But then, my silly phobia about working with knits would rear its ugly head and the project was put on the back burner. 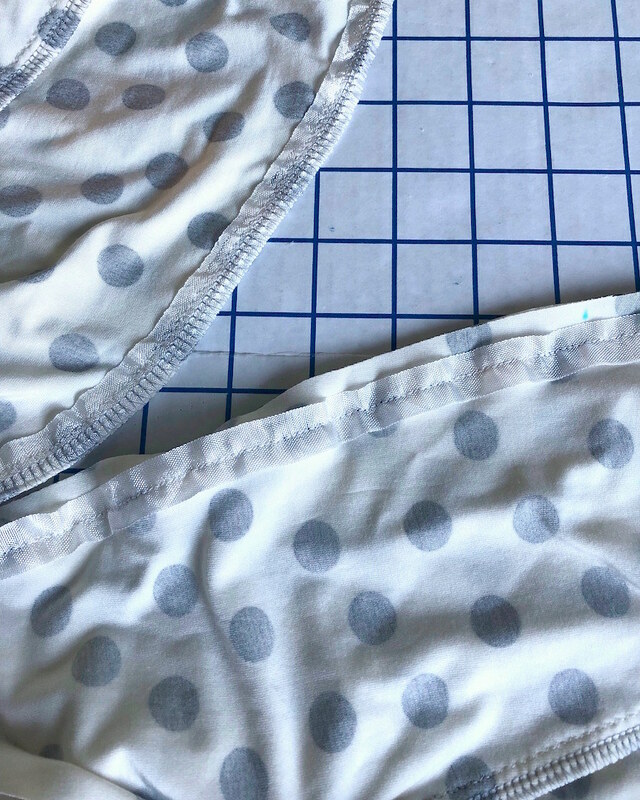 I used a narrow zig zag on the sewing machine to stitch the seams. And then I pulled out the serger . . .
Yikes. To be honest, there were some harsh words, and a threat to pitch the whole thing out the window. You see, I decided to be a big girl and change the threads, and that's where it all went wrong. I must have re-threaded the darn thing four times. 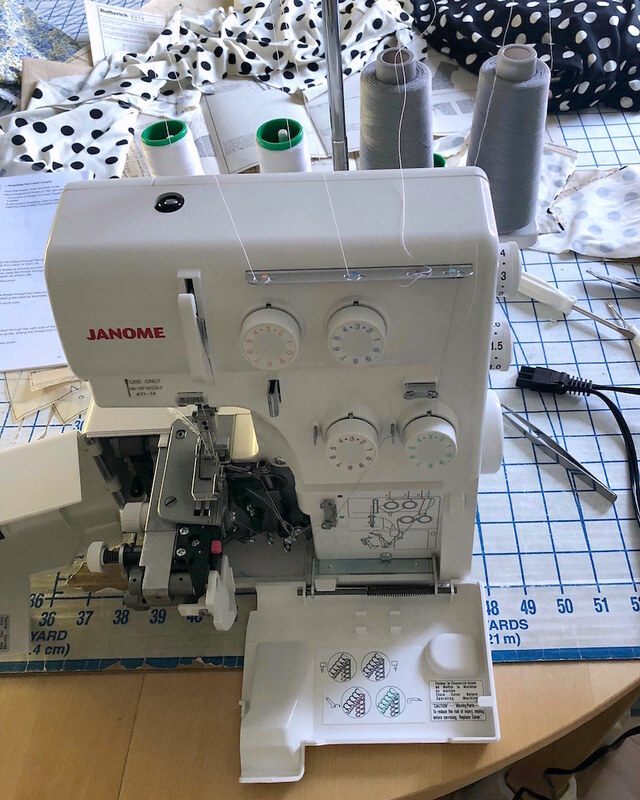 And it turns out, the only thing I was doing wrong was not pulling the thread taught through the tension dials (a step which is inconveniently left out of the YouTube videos I was watching - Arghhh!). But reading the instruction manual out loud step by step finally made me realize my mistake. At least I feel a lot more comfortable re-threading the darn thing after that ordeal! And there is something very satisfying about sending a raw edge through a machine that comes out neatly finished on the other side. 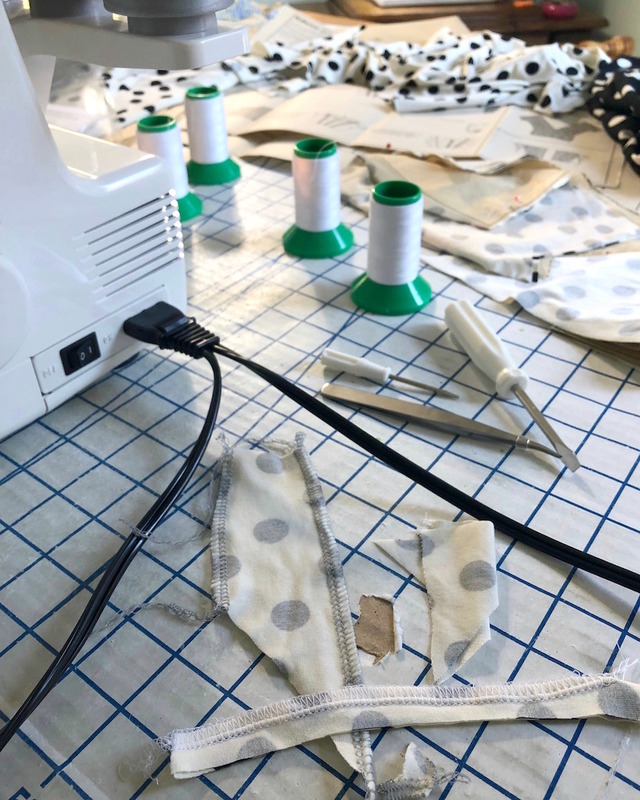 I remember that feeling when using sergers in the costume shop in college. Of course, I was not expected to maintain and re-thread those machines! 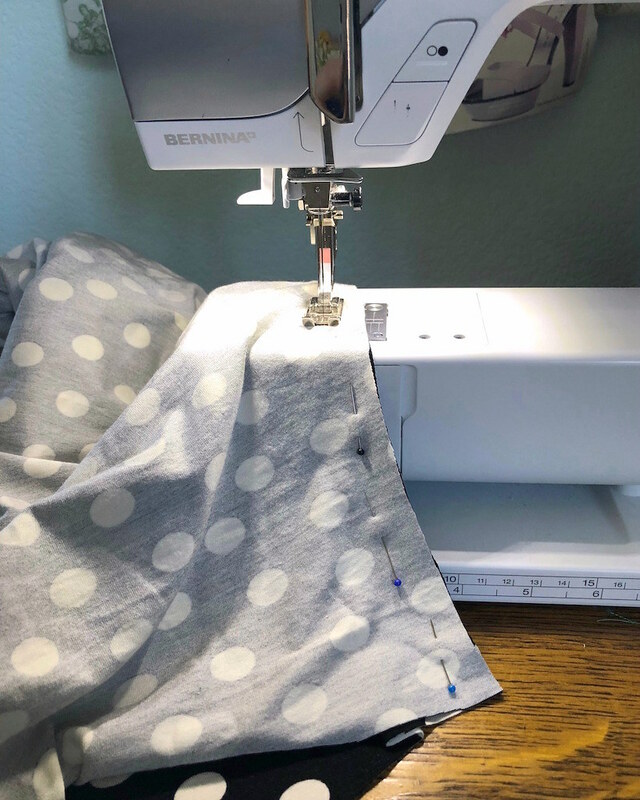 And while we are not best friends, I am learning to cohabitate and be civil with my serger. 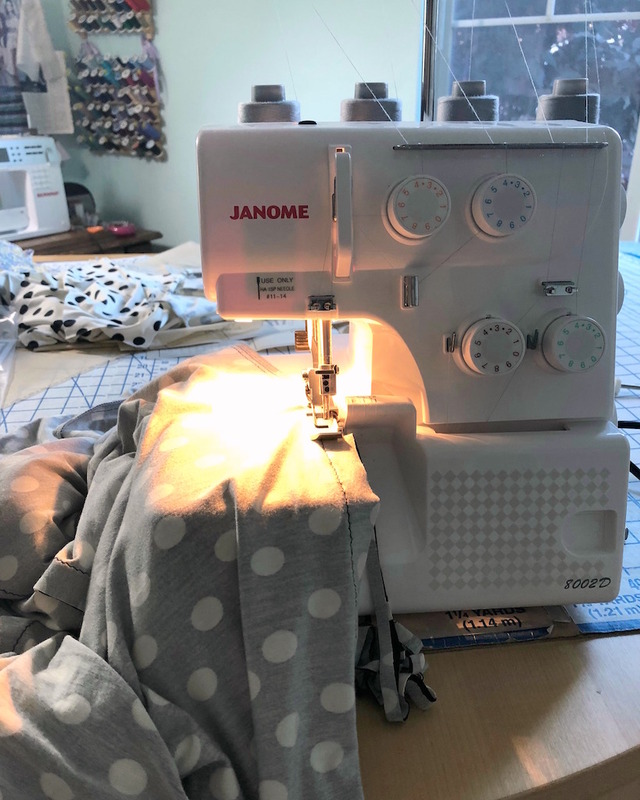 One thing is for sure, using knit fabric and a serger sure speeds the sewing process up. 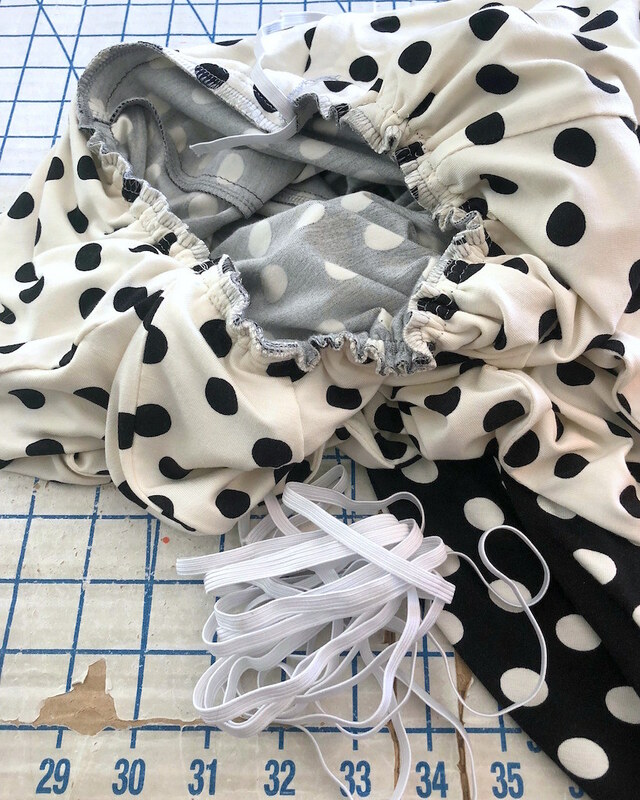 But rest assured, I am never going to give up my Hug Snug seam binding. I actually used it to stabilize seams on this dress - first, on the shoulders, and also on the front neckline opening. 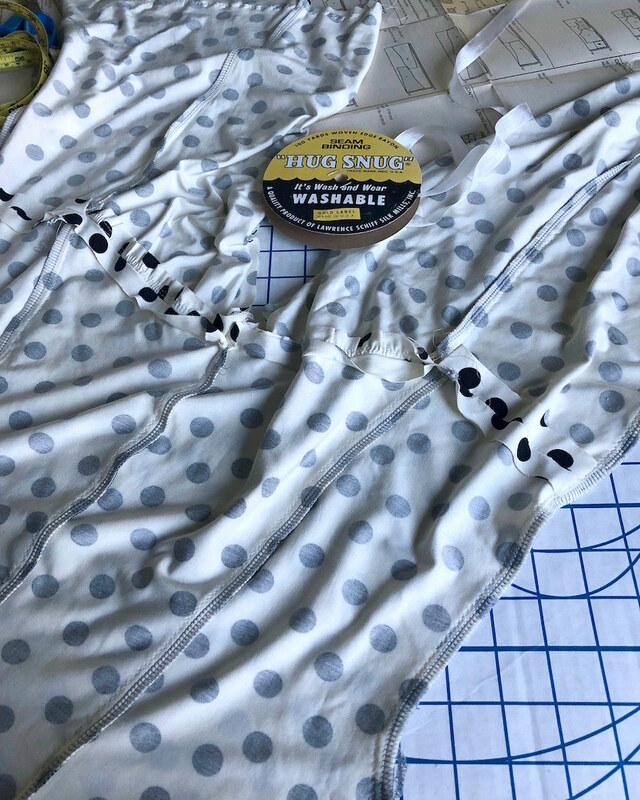 There are probably more popular stabilizing options when working with knits, but I hate that clear elastic stuff, not to mention the fact that I don't have any in my sewing room, and I love when I do not have to buy any new items to make myself a new garment. This was one of those projects, and for that reason alone I wan't about to make a special trip to the fabric store to purchase clear elastic. 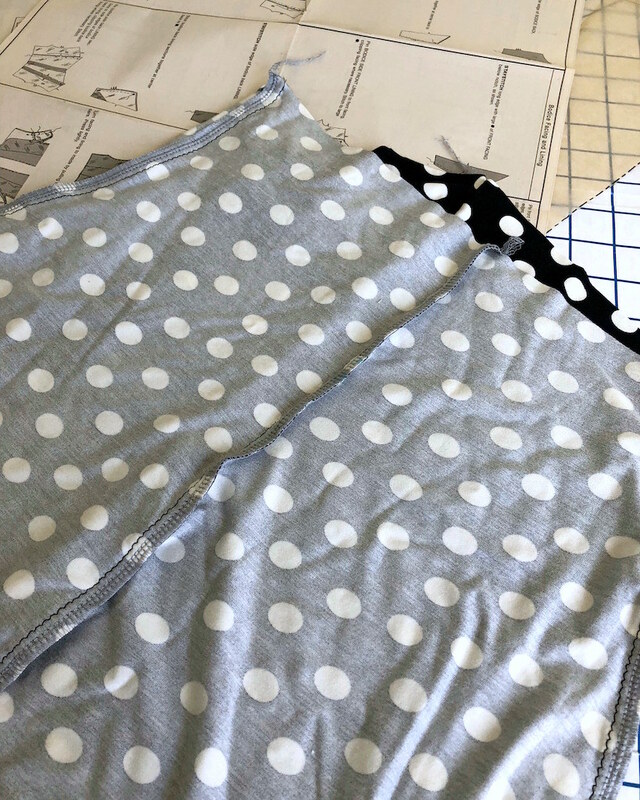 I borrowed a technique used in the Vogue 1027 instructions - adding a piece of elastic to a casing made using the waistline seam allowances. 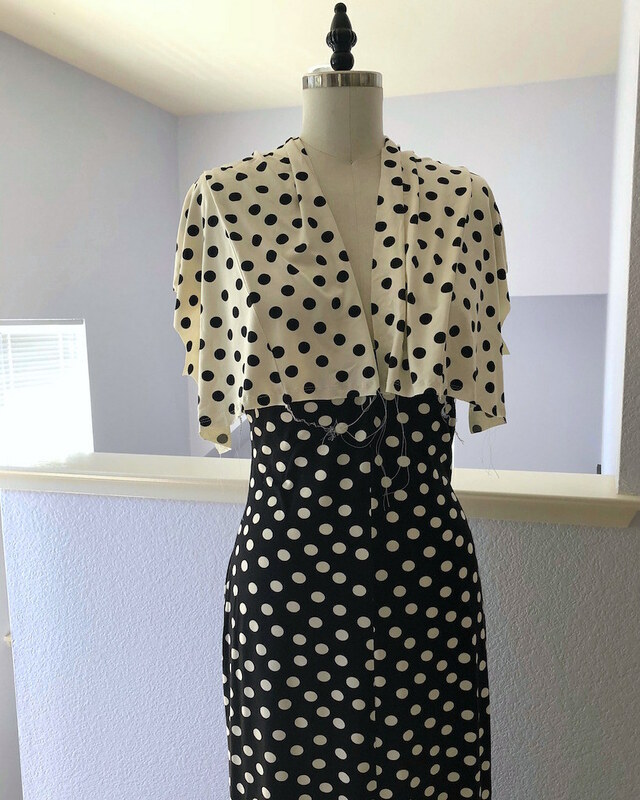 With the help of my serger, this looks slightly more professional looking than my navy polka dot Donna Karan knock-off, but I am still going to have to work on my serger technique. 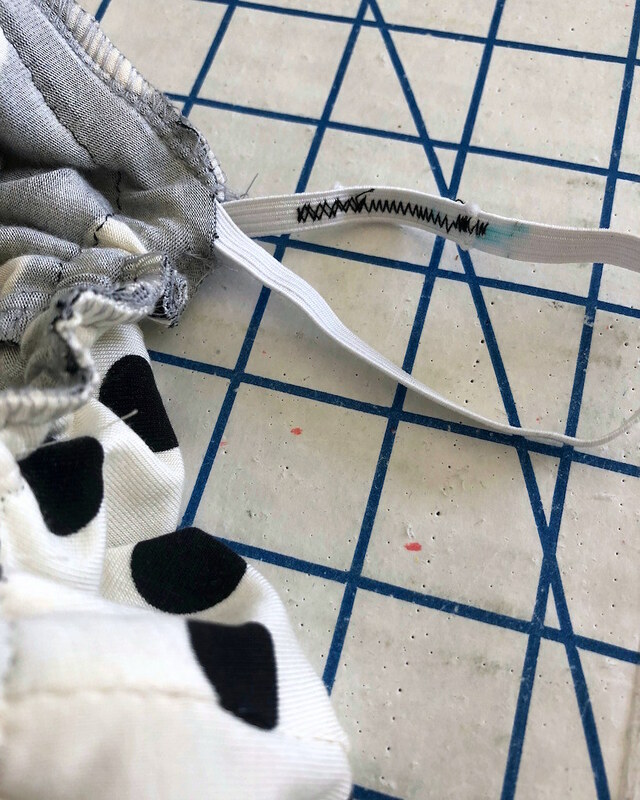 And I never really know how tight to make the elastic, so I inevitably need to shorten and re-stitch the ends together which happens to be one of my least favorite things to do on a sewing machine. But I think the weight of this textile and the length of the garment will be served well by the addition of said elastic. The fabric does have good stretch recovery, so I am hoping it doesn't stretch too much vertically. 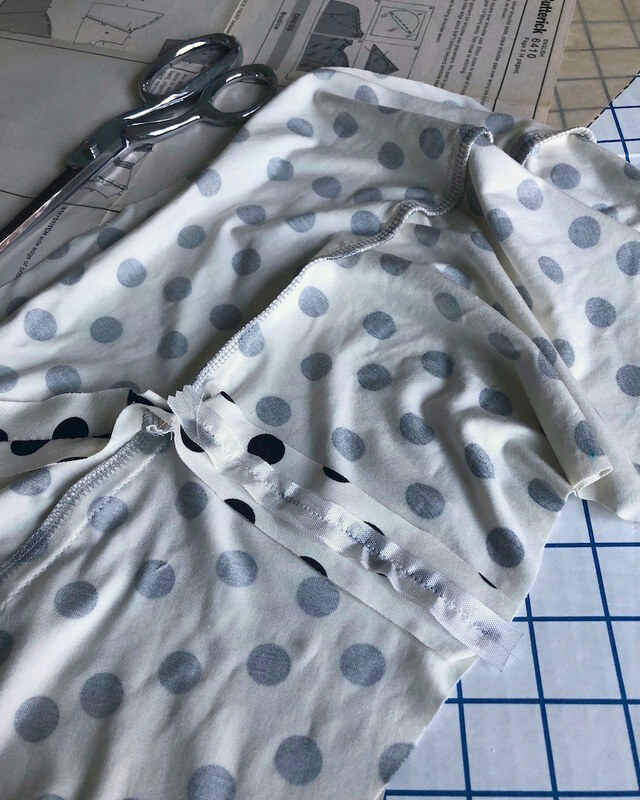 The final piece of the puzzle was the hem. 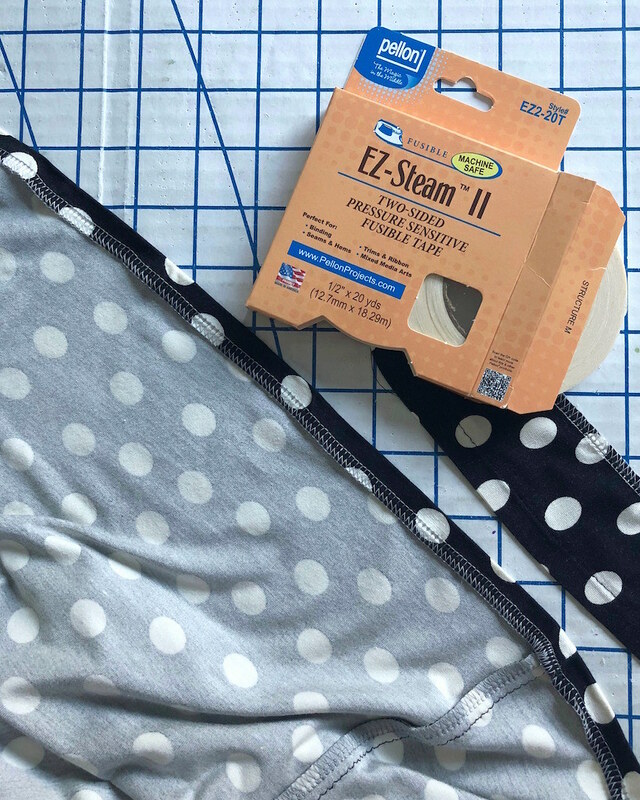 I am still not sure what to do with a knit hemline, but this time I used EZ-Steam. 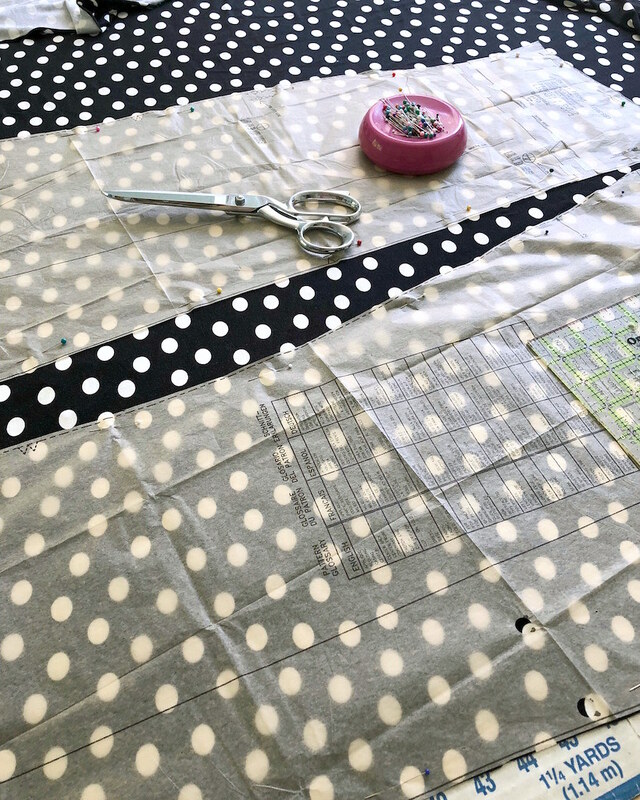 It's a bit finicky to work with, but it does make topstitching look a lot nicer. 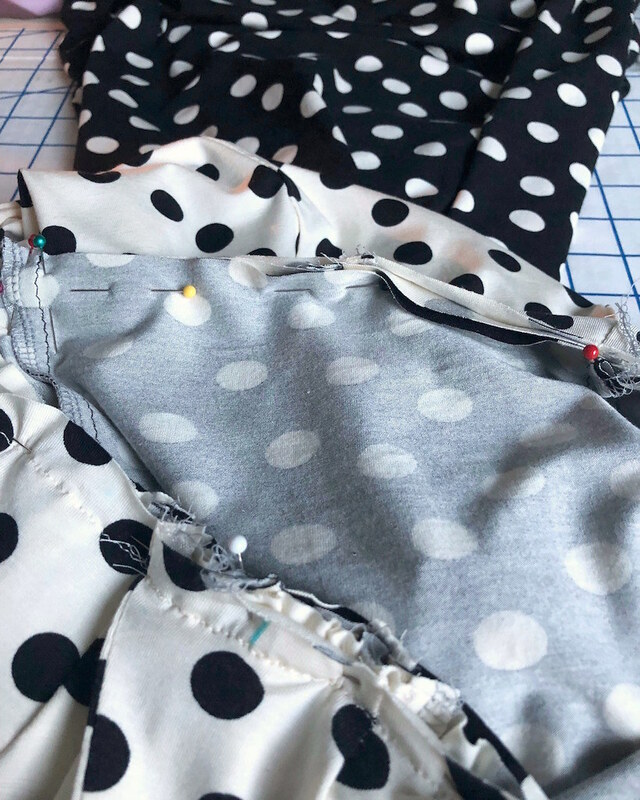 But what do you use if the hemline needs to stretch in order to get a garment on and off the body? Because this stuff definitely would not work for one of those garments! There is a wash away version of stablizer tape. You use it tonight the same way, but it washes away in the laundry leaving you with a stretchable hem. that dress is adorable. 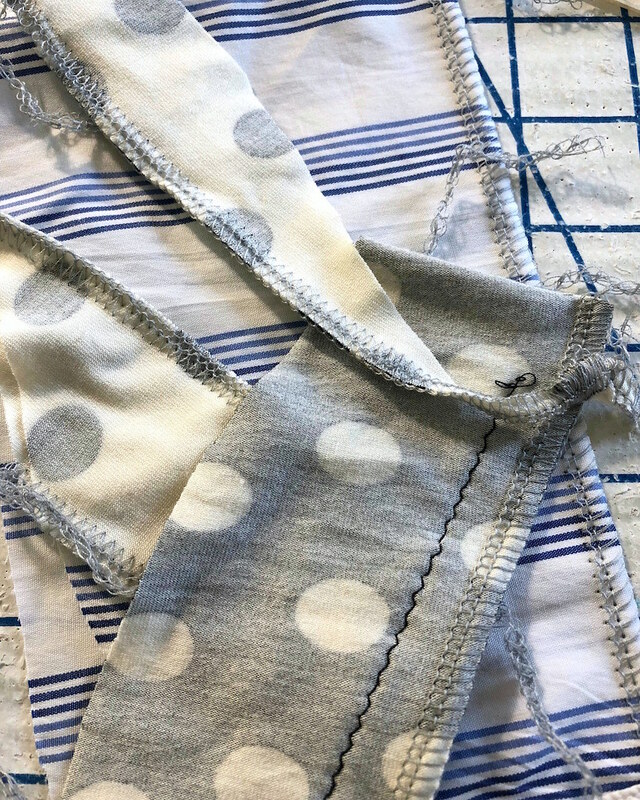 And I am probably the only person that never uses a serger on knits, it actually seems pointless to me as they don't unravel. I find it useful mostly for denims and cottons. I love this pattern and bought it a while back, it never occurred to me that this could be used with a knit. It looks like it works great for a knit, so no zipper? Your dress is adorable and I hope you post a photo of yourself in it. Yep - no zipper! Which is part of the reason this went together so quickly. This is beautiful, as always. A coverstitch hem would be lovely on the same, also. I, too, hope you will post a photo of you in the same.